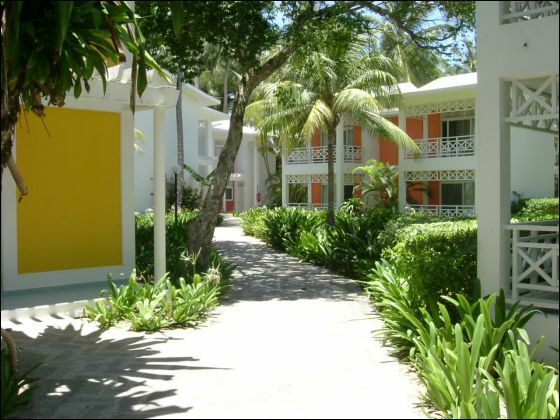 The first-class Riu Taino nestles in the midst of a spectacular palm grove and exuberant tropical vegetation. The 620 bungalow-style guestrooms are perfectly designed for a pleasurable and relaxing holidays and include unique amenities such as Riu's popular mini-bar and liquor dispenser. Enjoy a tantalising selection of food and beverage options, including exchange privileges throughout the Riu Resort, a wide array of day and night activities, a full service spa, night club and an exciting casino. 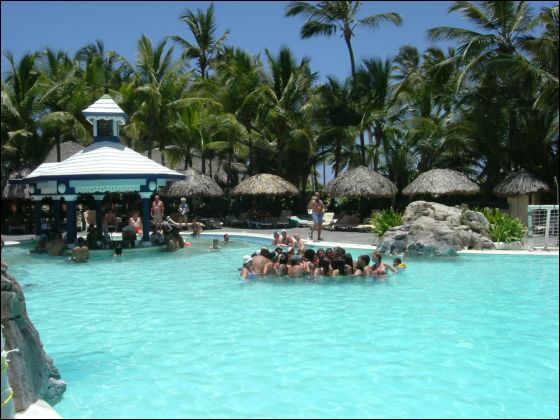 Riu Taino is the perfect choice for a fabulous holiday getaway. We had a great time in at the Riu Taino Punta Cana! The weather was awesome. It was very relaxing. Thank you very much for all of your help. We'll keep you guys in mind for future trips and refer all of our family and friends your way too. You all really are the Punta Cana Experts! Thanks for the Welcome Home Email! In response to your request for comments on - flights, transfers, pools, food, service, rooms, beach, entertainment etc. – we offer the following details below. But overall, it was a great vacation (surf, sand and lots of sun). Hotel & food was very good, drinks were plenty and service was friendly. Teresa and I had a very wonderful vacation! Flights (Very Good) – On-time, good support for arrivals and departures. Non-stop flight is always good. But the in-flight movies were both poor choices (Ms Doubtfire and Stardust). We were not told that we had to buy our food on board; not an issue, just we didn’t know otherwise we would have brought a sandwich from the airport service. Transfers (VERY good!) – Apple people waiting with nice bus at Punta Cana and again at the hotel on return date (though next time we won’t sit in front – driving on those roads was eye-opening. We were told by you, about the $10 tourist tax at the airport, again not a problem. Pool (Very good) – Both pools were clean, but it was crowded (Christmas/New Year week for holiday) so we had to get there early to reserve a chair. Definitely not RIU Palace-like pools, but very good.Food (Very Good) – We both enjoyed the wide-variety at the buffet and the specialty restaurants food was delicious! Good fruit selection. Service – (Very Good) – Front Desk always answered questions quickly. (It helped that I speak Spanish); Tad disappointed that I did not get a 1 hour late checkout (12pm to 1pm) since we had a 1:20 pm bus departure but I’m sure it gets back to holiday crowds. - Bars were well staffed and friendly; didn’t have to wait at all for drinks.- Restaurants were good. They did it all very nice and extra nice for New years Eve. My only comment is that that 2 of the restaurants were buffet instead of sit-down service. I’m guessing with holiday crowd they went to buffet. We did enjoy meals at both Riu Naiboa and Riu Bambu, but the Riu Taino was the closest to the surf with a lunch and breakfast view! Rooms (Good) – While the weather was warm, the room felt very cool. Beach (Excellent) - They could not have done a better job keeping the beach clean. They were out early and often cleaning. Palm trees, plenty of chairs and sunshine! Entertainment (Good) – Their shows did not seem as well rehearsed as the one’s in Jamaica and Cancun, but they were some what entertaining. The New Years Eve set up was spectacular! We had one rainy day on Friday and they did a great job of accommodating by bringing all the activities inside. We took in a show at the Riu Bambu and it was the same quality so we knew we weren’t missing anything. All in All - we had a wonderful Holiday Getaway! For the price and time of the year - it really was worth our while! Thanks for helping me find this last minute surprise for my wife! How are you? We had a really lovely time, thank you! Everything was perfect and went so smoothly - the hotel was very nice and the staff and people on the island were so amazingly warm and kind. We loved the hotel beach and spent the majority of our time there and exploring the premises of the resort which was so beautiful. The Riu Palace Punta Cana was breathtaking and if we make it back to DR again we would definitely be interested in staying there next time, but maybe at a less expensive time of the year (Holiday Travel is the priciest week of the year to travel, I know). All in all there were no complaints to be had, it was a wonderful vacation and thank you so much again for helping me book it all at the last minute!! Yeah, we’re back, and all I can think about is being back in Punta Cana! We had a ball. The weather was great, we all got tan! A lot of clouds, rain almost every day (but mostly at night), but a good amount of sun mixed in. As far as the hotel – we loved it! The animation team is wonderful, and we ended up being their “pets” as we seemed to participate in just about everything, and they love that! I even did some Karaoke! Of course it helped that my daughter Pam is a “party girl” – they took a particular shine to her. They really go out of their way to make sure everyone has a good time. We spent a lot of time up by the pool as a couple of days it was pretty windy down at the beach, but I made sure I walked the beach a lot (several LONG walks a day). The beach is phenomenal! The other guests, for the most part, were great! We got particularly friendly with a family from Luxemburg with 2 small boys (about the same ages as my daughter Pam’s sons) and several others from Canada, so that always makes it more fun. The food was good, with breakfast being the best meal by far! I did find that the food was a little varied, but there was always something you liked, even if it was just pasta! The rooms were perfectly comfortable, and ours was in the perfect location. We were in rooms #321 and 322, which were close to the pool/beach and also very close to the dining room. All in all, it was a great vacation, and I would recommend this hotel to anyone and sing your praises any chance I get! Thanks for all your help on ALL our behalf!